The code which you highlighted is copied into the dialog automatically. 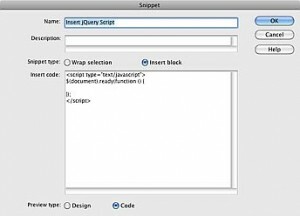 All you need to do is give the new Snippet a name, and decide how you want the snippet applied. You have two choices, you can either wrap code around a selected element (in this case, you would need to write or copy/paste some additional code into the Insert After field), or chose the Insert Block option to simply insert the block of code in the current cursor location. Now, the next time you need it, you can simply double click the snippet in the Snippet Panel – or, even better, use a keyboard shortcut! 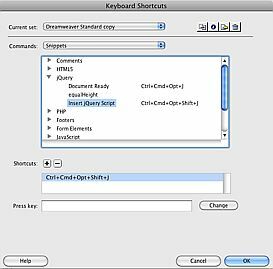 Simply choose the Keyboard Shortcuts command from the Dreamweaver menu on the Mac or the Help menu on Windows (I believe – sorry, I’m a Mac guy). You’ll need to duplicate the standard keyboard shortcut set. Once you’ve done this, you can choose Snippets from the Commands drop-down menu. Select your newly created snippet, and then simply press the keys that you want to use as the keyboard shortcut. If you accidentally chose a key combination that is already assigned to a command, you’ll be warned and have the option to either choose a new combination, or wipe out the shortcut on the other command and assign it to your new snippet. Great post. Very informative. Tips like these are what I look for to become even more productive. Thanks! The snippet feature is also in HomeSite & ColdFusion Studio (maybe CFBuilder too, not sure.). I use DropBox to share snippets w/co-workers & keep them synced with multiple computers. I definately need to use this more. Vienna is the Capital of Austria and a relaly faboulous place to visit. Just stroll around and visit Spanish riding School or any of the fine parks that are all around Vienna. The snippet panel is not new to CS5 has not changed for about 3 versions. It is very useful I use it in CS4. There also a very good jquery extension called jquery utilities toolset that is freely available from Exchange. Works great in CS4 not sure about CS5. I too forgot about the snippets panel and was foolishly looking for extensions instead. Not to mention the fact I was considering learning to write my own ugh. Greg, consider using text that’s a lighter color (against the dark background) so people can actually read your blog, or…hold on now, this is out there…keep the dark text and lighten the background! Anything that has “snippet” in the title has to be good.